It hurts when you climb out of bed and stand up, often like a stabbing pain in the heel. Or frustratingly, after you put on your running shoes and start your workout. Or simply when you are standing in line at the grocery store or bank. The pain is stubborn. You wish you could sit down, but you can’t. Maybe your job won’t allow you to. Or you really do not want to miss your workout. Acupuncture can help you, and here is how. Look at the illustration. (Click/select the image to enlarge it.) 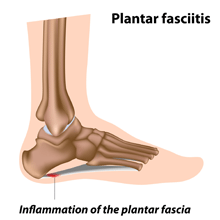 You will see the plantar fascia, a thick band of fibrous tissue, and the most common cause of heel pain. It gets inflamed and painful by repeated micro-trauma, especially where it attaches near the heel bone. If you are an endurance runner, if you have flat feet or overly-high arches, if you are overweight, or if you have to stand for hours everyday on a hard surface, you are more at risk. I needle points that affect the heel indirectly. Part of the magic of acupuncture lies in its ability to stimulate healing in one part of the body when a seemingly unrelated area is needled on another part of the body. I treat the painful areas of the heel to directly stimulating healing. The needling can be challenging with patients who have thick heel callouses, but by applying pressure with the insertion tube, I have found that the patient is generally quite comfortable. I also treat other affected areas in the arch and the deep intrinsic muscles of the foot. I treat tender areas in the calf muscles, as these are generally tight and often contain trigger points which refer pain to the heel and the achilles tendon. How does it respond to acupuncture? In my experience, quite well, sometimes with an encouraging reduction of pain after the first treatment, and usually with a significant or total reduction after a series of treatments. It is better to rest during the course of therapy, but some patients cannot because their work does not allow it, or they will not because they are competitive athletes. Acupuncture still works. Take the case of Jeffery Johnston, for example, an ultra-marathoner I treated, who was in a lot of pain from his training, but who was able to continue training due to the acupuncture, and went on to complete a 100-mile race. Read Jeffery’s and other testimonials from patients who had plantar fasciitis treated by acupuncture. You can search all testimonials using the Search Testimonials by “condition(s) treated” box on the top right.